Every woman desires her body to be perfectly proportionate and has a healthy and trim figure. Often, we go to great lengths to lose weight and get in a healthier shape all around but we fail to realize that the loss in body weight (fat) also results in the loss in volume of the breast tissue, which causes sagging or drooping breasts which are undesirable. At Cocoona, we understand your need to look youthful and attractive with a truly proportionate body from head to toe. The advance and efficient breast implant surgery at Cocoona helps you regain a young and more appealing upper body. Breast implants are most helpful in reshaping the breasts to desired size and shape. This is usually required after a mastectomy for breast cancer (which removes the breast completely) as well as to reconstruct breasts in order to correct a congenital (birth) defect that affects the breast shape and size. Breast implants are increasingly being used for gaining a more full and curvy figure to the upper body. This is a completely cosmetic procedure performed at Cocoona by expert cosmetic surgeons and is done to improve the breasts’ appearance by altering their size, shape and firmness using artificial implant prosthetics. The breast implants are classified into three different categories according to the filler material used inside them. Saline solution – This is constructed of a shell of an elastomer silicone that is filled inside with a sterile saline solution. Silicone implant – This is also made of an elastomer silicone outer covering but contains a thick silicone gel inside. Composite filler – This implant also consists of an outer silicone elastomer shell filled with polypropylene string, soy oil or any similar substance. What is the Breast Implant procedure? Our expert cosmetic surgeons will first discuss the degree of change that can be given to your breasts. After the shape and size of the implant is selected by you and the cosmetic surgeon, you will be given a general anesthesia so the surgeon can perform the implant procedure without any form of pain or discomfort to you in its duration. The surgeon will make incisions in the lower part of your breasts for easier access to place the implant. The surgeon will first insert a tissue expander to make adequate space (this is also known as ‘implant pocket’) for holding the breast implant in place. This tissue expander is then removed and the implant is placed and fixed to the proper place. The surgeon will then stitch the incision closed. The surgeon might attach drainage tubes to your operated breasts for draining any excess fluid which might get collected. What are the advantages of a Breast Implant surgery at Cocoona? Are there any complications seen after a Breast Implant surgery? There are several rare risks and complications that you may face after a breast implant surgery. Implant rupture can occur after a long period of time which will require a re-surgery for placing another implant to replace it. Capsular contracture can occur around the implant in certain, cases which cause the immune system of the body to weave a covering of thick collagen fibers around the implant and put undue pressure on it. This results in pain in the breast. Hematoma (bleeding after surgery) is also seen in some cases. Seroma is caused when excess fluid gets collected in the operated region. Infection may occur at the incision site. Scarring might be seen for a longer time in some patients. How long is the Breast Implant procedure for? Although the duration of any breast implant surgical procedure varies depending on various factors, it usually takes an average two hours to complete the surgery at Cocoona due to the vast experience and extensive training of our cosmetic surgeons. How long does it take to recover after a Breast Implant surgery? Usually, is takes around a week to get back to work after a breast implant surgery. 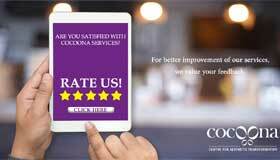 Cocoona uses the most advanced and minimally invasive procedures for breast implant surgery which decrease the recovery period even more and allow you to resume everyday activities sooner than expected. Which is the best Breast Implant material? There is no way to compare the various breast implant materials as each has its distinctive properties. A discussion with our expert cosmetic surgeon at Cocoona will definitely help you select the one which is best-suited for your particular case.